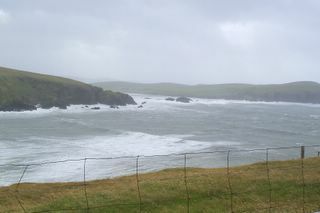 Shipping forecast said "Violent Storm Force 11" for today, Monday at 10.00 am, and this is what that looks like. Not hugely impressive, visually, but it's a funny direction for us - south westerly and I'm not convinced it really is that strong a wind. Mind you, I didn't really want to get out of the car, because there are various objects flying through the air - cows, sheep, small buildings etc. So far no power or phone cuts, so the show goes on from the Barn of Bannocks. If the roof remains intact. Roll on next year! I mean, what other festival has EVER featured live kipper-smoking (there it is, in front of the 'Scott's Fresh Fish' van)? It was wet, but it wouldn't have been Scotland if it was dry, would it? Thanks a million to Joe Gibbs for allowing his lovely estate to be trampled and churned. 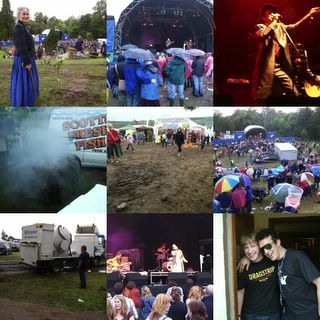 The pictures show, variously, Margaret Bennett and the lime tree planted in memory of her late son Martyn; Ricky Ross and Davie Scott on Saturday afternoon in the worst of the rain; Larry Love of the Alabama 3 in full flight; kipper smoking; Cosy Camping amid the mud; looking down on the main stage; extracting the 'honey wagon' from the mud' Emiliana Torrini on Friday; Larry Love and Mr James Morton of Hillswick. 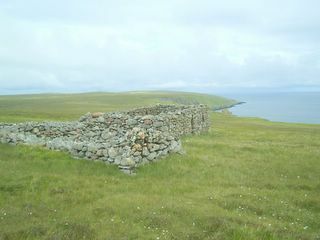 Sannions is one of two crofts north of Boatsgeo, Heylor, Shetland, cleared in the 19th century. The other is called Sumra, and both roofless houses were evidently carefully and strongly built. I walked out from the road end on Saturday morning, the first time I'd ever been there. And it's amazing. Further north on what I suppose is the Tingon peninsula, there is the landmark headland called The Faither, large lochs, and I already know the volcanic outcrops and huge waterfalls. But the two crofts are incredibly atmospheric. You stand inside the walls, the wind dies away, and you can imagine everything that happened there in the past. Below Sannions is a small beach, obviously used as a landing and reached by a precipitous path down the geo. On Sunday I was at a party with some local folk who knew the crofts well, and one man whose great grandfather used to dry fish on the same beach, every day during the season of 'Da Haaf' - the great herring fishery, conducted in open boats far out to sea. 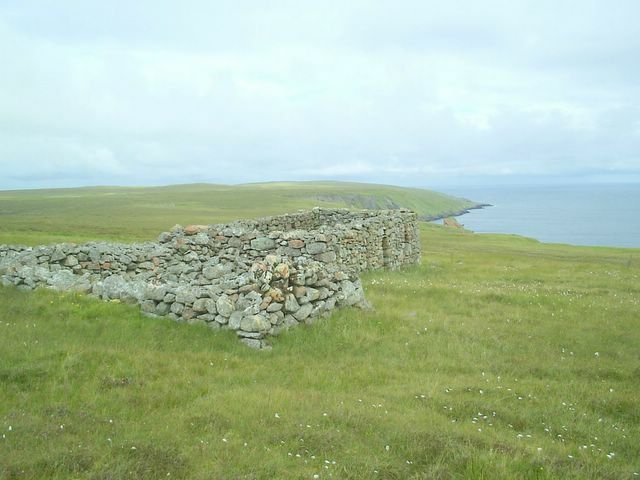 The crofts were cleared, apparently, after two Shetlanders came back from a profitable gold mining expedition and bought up the land. 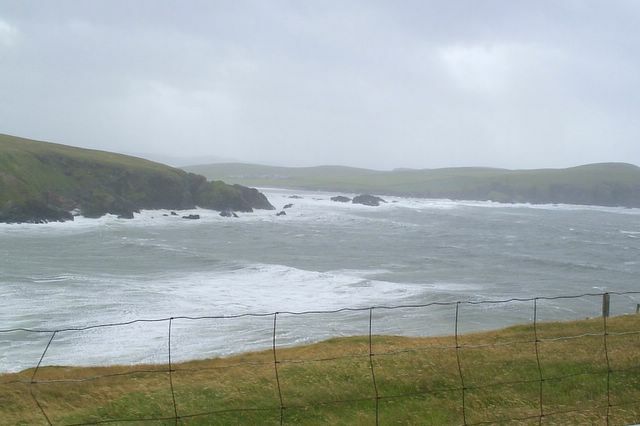 The Sannions and Sumra families loaded everything they owned - animals, furniture, goods and chattels, even the newly-cut corn, and sailed up Ronas Voe, landing at the head. I had to leave, alas, before exploring Sumra, but I'll be back. It's one of the strangest, most melancholy, yet seductive areas I've ever been in Shetland.